When the Department of Tourism (DOT) and the National Historical Commission of the Philippines (NHCP, formerly National Historical Institute (NHI)) launched the Jose Rizal @150 Heritage Trail Project, Tutubi wasn't able to get even a Rizal passport (you need to get it at the DOT) and though he has been to most of the sites mentioned there to be visited, he didn't bother to re-visit just to get a stamp. Now here comes the celebration of the 150th birthday of Andres Bonifacio that will culminate on Bonifacio Day, as knows how to get to all the places associated with Andres Bonifacio in Metro Manila (one particular site is within 10 minutes from his home). 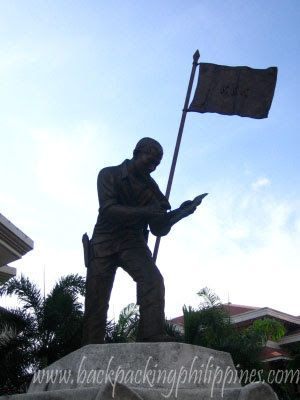 In celebration of the 150th birth anniversary of Andres Bonifacio on 30 November 2013, The Department of Tourism (DOT) and the National Historical Commission of the Philippines (NHCP) cordially invite the public to rediscover and visit the sites associated with Bonifacio’s life. Visit the sites featured in the Bonifacio @ 150 brochures and paste your photos taken at the sites provided. The first 100 participants to complete shall receive a token and a Byaheng Bonifacio: Byaheng Bayani ng Bayan certificate, subject to validation by the NHCP. All finishers will receive a Ka- Byahe ni Bonifacio certificate. The competition is open to all domestic and international tourists. Organizers, sponsors and members of the Bonifacio @ 150 Technical Working Group Committee / Organizing Committee are not eligible to join. A. The token and certificate may be claimed at the office of the National Historic Sites and Education Division, National Historical Commission of the Philippines, T.M. Kalaw Street, Ermita Manila. B. Winners shall shoulder all cost they will incur in claiming their prize. C. When claiming their prize, winners must present to the authorized NHCP representative the completed brochure and a valid ID with name, address, photo and signature. D. Winners should claim their prizes within sixty (60) days from receipt of notification; otherwise, the prizes will be forfeited in favor of the Philippine government. Via LRT 1 : Alight at Doroteo Jose Station, walk towards CM Recto then ride jeepneys going to Divisoria. Parking, Dining stops and comfort rooms are available at Tutuban Mall. Taxis are also available going to the area. The area is near Tutuban Mall. Best to park in Tutuban Mall then just walk towards El Cano Street. Dining stops and comfort rooms are available at Tutuban Mall. Tips: Best to park along the streets or pay parking areas around the church. Dining stops with comfort rooms are available at Ongpin St and other streets near the church. Taxis are available going to the area. Tricycles are available along Congressional Avenue going to the site. Parking available within the park. No dining and rest stops available near the area. The location is next to the Pugad Lawin High School and Quezon City General Hospital. The Shrine is open daily 8:00 AM to 5:00 PM. UP Ikot jeepneys are available going to the area then board a tricycle going to the barangay hall. From Recto, buses are available going to Ortigas, alight at Pinaglabanan St. in San Juan. Jeeps are available going to the site. From Ortigas, ride a bus going to Quiapo, alight at Pinaglabanan st in San Juan City. Tips: Parking and comfort rooms are available on-site. The Pinaglabanan Memorial Shrine is open daily. The Museo ng Katipunan is open from Tuesday to Sunday, 8:00 Am – 4:00 PM. Jeepneys from Kalentong, Quiapo and Pasig passes by Shaw Boulevard. Alight at Bonifacio St. Tricycles are available going to the Hagdang Bato Barangay Center. Street parking available for buses, small vehicles can park at the barangay center. Comfort rooms available at the barangay hall. Via MRT (1): Alight at Ortigas Station , walk towards Robinson’s Galleria, FX and jeepneys going to Pasig Bayan are available. The Church and the Marker are within the town center. Via MRT (2): Alight at Shaw Boulevard Station, FX and jeepneys going to Pasig bayan are available. The Church and the Marker are within the town center. Via Jeepneys/ FX: Jeepneys and FX plying Quiapo-Pasig Bayan that passes by Shaw Boulevard are available. Church and the Marker are within the town center. Parking, Dining stops and comfort rooms are available in the area of Pasig Bayan. From Cubao, buses, jeepneys and FX vans are available going to Rodriguez. From the town center, tricycles can bring you to the site. A designated parking area, registration office and comfort rooms are available at the area. Dining stops are available around the town of Rodriguez. Visitors need to pay environmental fess (P2.00) upon entrance to the park. Buses bound for Dasmariñas passes by the Imus junction. From there, jeepneys and tricycles are available going to the Imus Plaza. Street parking around the plaza, Dining stops are available near the plaza. Comfort rooms available at the Imus City Municipal Hall. Buses bound for Cavite City passes by the Noveleta Municipal Hall. Walk towards the tribunal located at the back of the municipal building. Street parking near the municipal hall, Dining stops are available in the area. Comfort rooms available at the Noveleta Municipal Hall. Open daily from 8:00 AM – 4:00 PM. No entrance fee. Buses bound for Ternate/ Naic/ Maragondon passes by the Tejeros junction. From there, ride jeepneys or baby buses bound for SM Rosario or Cavite City which passes by the Tejeros Convention Site. Parking and comfort rooms are available at the building compound. Dining stop at nearby SM Rosario. Buses bound for Indang are available in Baclaran. Alight at the town center of Indang, tricycles are vailable going to the site. Street parking only. Dining stop available at the Indang town proper. Buses bound for Ternate/ Naic/ Maragondon passes by the Naic junction. From there, ride jeepneys, baby buses or tricycles going to the town plaza. The Casa Hacienda is just a few minutes walk away. Parking and comfort rooms available at the town plaza area. Dining stops are available around town. Buses bound for Ternate/ Naic/ Maragondon passes by the Maragondon junction (Brgy. Garita). From there, ride jeepneys or tricycles going to the town plaza. The Trial House is just some few minutes walk away from the public market. Street parking only. Comfort rooms available at the Shrine. Dining stops are available around town. No public transportation going to the site. Because of the all-weather road, private vehicles are best to use during dry months but at a certain point only. Hiking is best going to the site [about one (1)hour]. Tourists are advised to coordinate with local guides at the Local Government of Maragondon before proceeding to the site.